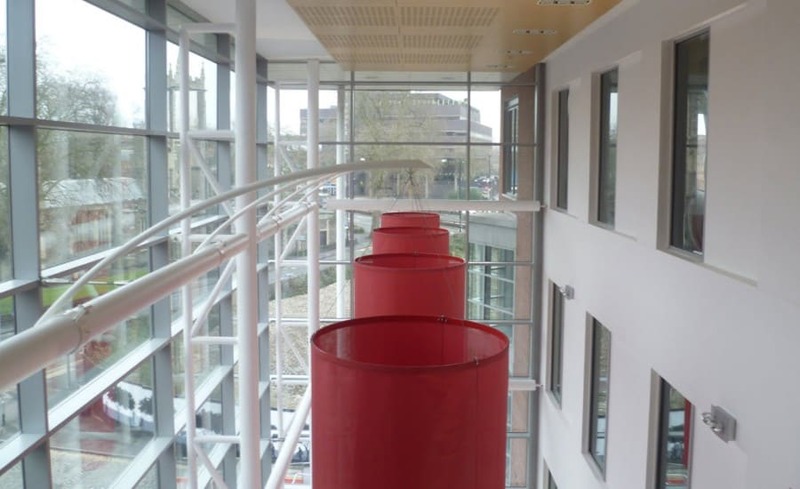 Overlooking the floating harbour in Bristol is Tower Wharf, a prominent high quality office building with an impressive full glazed four story atrium. 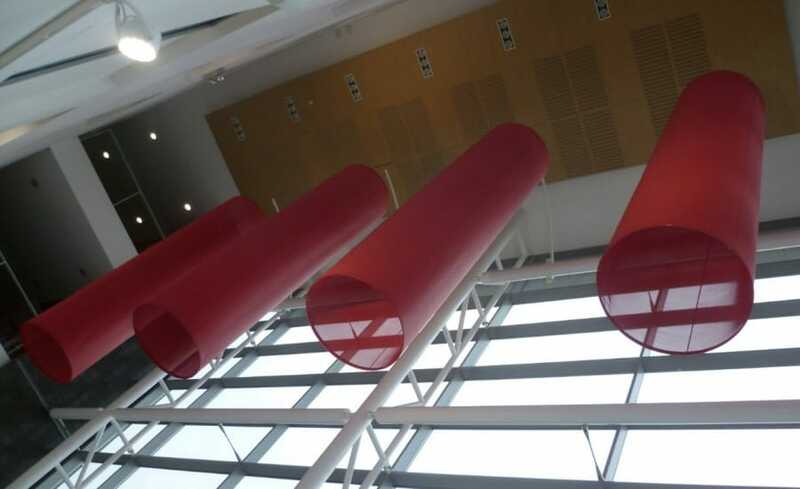 An atrium of this size was the perfect canvas to create floating interior fabric sculptures for colour and interest. Working with Commercial Interior Design Consultancy, CJ: IA, many interior design ideas were considered. The result is a solution that is bold and beautiful. 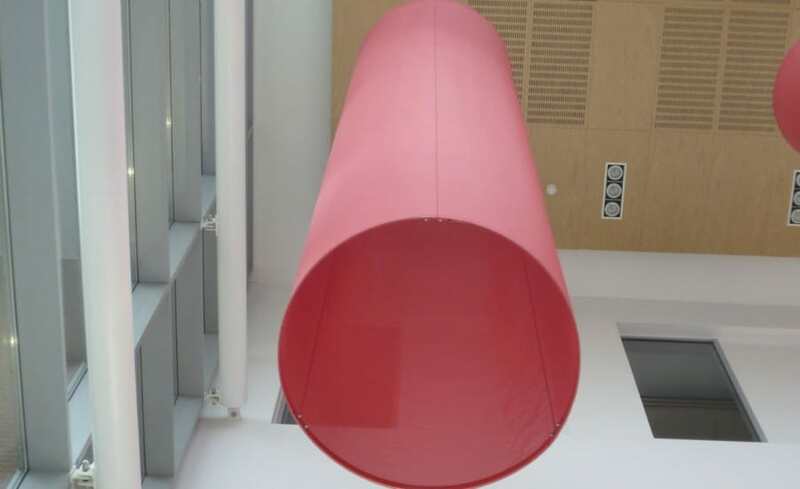 Four bespoke gigantic fabric cylinders, each measuring 1100 diameter x 4800mm high, were suspended by stainless steel cables (giving the illusion they are floating). The fabric selected is Soltis 86 Mesh and it was colour matched to a specific red, as per the clients request. 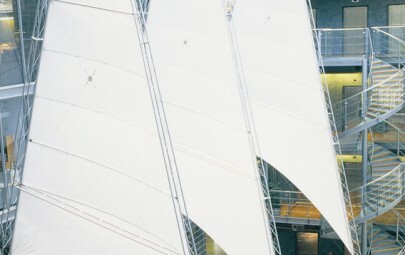 Steel cables connect to arched steel masts. These masts were designed and engineered to affix to the buildings existing steelwork and had to be strong enough to hold the cylinders. Wind is generated in an atrium of this size, which is why engineering had to be considered. 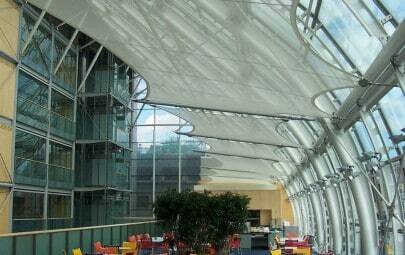 While the fabric sculptures are stylish, they also help break the vast space acoustically, while diffusing the sunlight from the glazed wall. 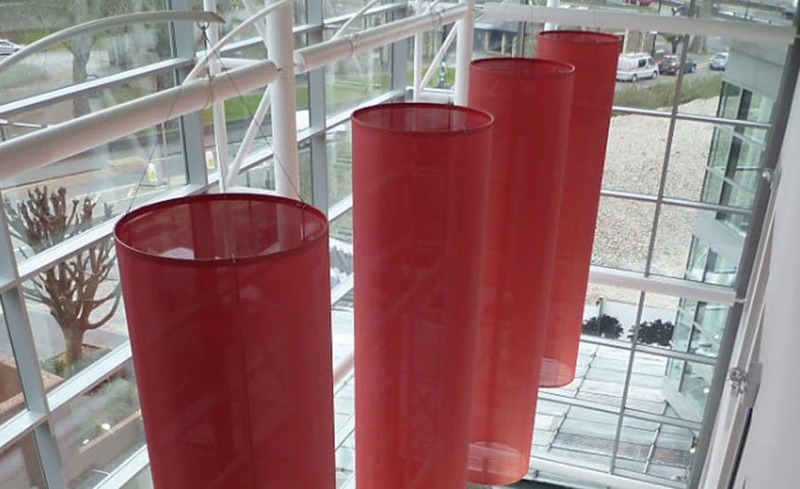 Using our in house manufacturing facilities, we controlled the entire process from concept to installation. This allowed us to ensure the client got exactly what they requested, while staying within a tight budget. Working at heights of nearly 12 meters is always a challenge as was positioning the cylinders. 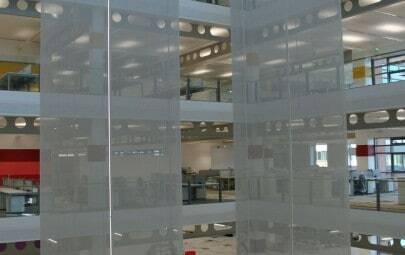 The placement was important, given the client wanted the structures to be noticed from the outside of the building. Careful consideration went into centering each cylinder along the inside of the large atrium. The result is a sculptural interior installation that is eye catching and impressive. Thank you to CW Duke for their partnership in the project.